For the People, by the Poet, (FP by the P) is a column written by local street poet Rashaad Thomas that highlights, celebrates and supports local poets in Arizona cities. Poets outside academia often feel excluded from the dialogue that influences diverse communities using new and innovative methods, and this column aims to highlight some of the poets working "on the ground" here in Arizona. It’s an extreme pleasure to co-curate Poetry Spot with Phoenix Poet Laurette, Rosemarie Dombroski. Over the past six months, azcentral.’s Poetry Spot has given me the honor to get to know Arizona through the eyes of poets and their unique narratives. One submission caught our attention with a lurid whisper. We felt the poem “Raspberries do not blush in the sky” fill our ears like a raspberry’s scent rolls by a nose. Amber McCrary’s poem moved me to travel the Internet to find more of her work. My first stop was an Instagram video on her profile. “For the most, part zines are very—kinda like underground culture. Part of the do-it yourself culture,” she said. The bravado of her words told a story about her passion to maintaining her creative agency through producing zines. I can relate because I pop-and-lock in underground tunnels, hip-hoping and be-boping with my tribe. It was only after I heard her speak that I realized we already followed each other on Instagram. It’s amazing how you can exist in the same art community and never meet a person whose work has had an immediate impact on you. I DM’ed Amber; we scheduled to meet on a sacred Sunday morning in a caffeinated space. A couple days later, I DM’ed Amber again to find out where I could get my hands on her poetry collection. Palabras Bilingual Bookstore, she said. I rushed to the store and found the treasure. I found out she had published three of her own poetry collections in as sort-of zine: DANG! Daydreamnig Awkward Native Girl, D.A.N.G! Vol. 2 Daydreamng Awkward Native Girl!, and ANGSTY ASDZÁÁ. Excited to meet Amber, I arrived early to the coffee shop. About halfway through a cup of iced tea, a young woman with a purple beret and high polka-dot socks breezed through the door. It just wasn’t her style that caught my attention, but the creative energy that followed her through the door. We walked to the first empty table and simultaneously sat down, exchanging pleasantries. There was a little small talk, but then I had to know. I started with the cliché questions: “So, tell me about yourself.” She shared that she was born in Tuba City, near Flagstaff. She told me about her family’s background, her boyfriend. She struck with a statement that caught me off guard: “I didn’t see myself as a writer.” The beauty of her blog, zines, and poetry collections popped in my head. “But wait, you are a wonderful writer,” I responded. She told me she didn’t feel like a writer until she took a class with Natalie Diaz at Arizona State University. Natalie gave her the support and encouragement she needed to imagine herself as a writer. Her talent established, we started to dig into the surface of her heart and the dirt of her Rez experience. Her poetry doesn’t hold back from the honest truth. I asked her about the vulnerability, about the violence she experienced in her life, about her father and brother who continue to struggle with alcoholism—a theme revealed in her poetry. “Did you ask your father and brother about the content or read it before you publishing these poems? Amber’s poems confront intergenerational trauma and sexism. A number of poems stopped my breath. I found myself holding the air in as I read, waiting to find a sense of reprieve. The poems describe her experience with trauma from her youth and its effects on adulthood. Her collections share difficult experiences that I’m sure many readers and listeners will relate to. But Amber also takes care of her readers. Throughout her collections, she intersperses the hard and traumatic with the soft and healing touch of love for self, and intimate moments with her boyfriend. Amber and her poems inspire me to focus less on each experience’s wins and losses and honor the lessons that nurture you to grow stronger. Recently, she left Arizona to start a new journey. She is a Master of Fine Arts Candidate at Mills College in Oakland, CA. I know a lot of artists move out of Arizona to seek hopeful opportunities. But I’m crossing my fingers that Amber returns to Arizona and adds her voice to the Arizona winds. 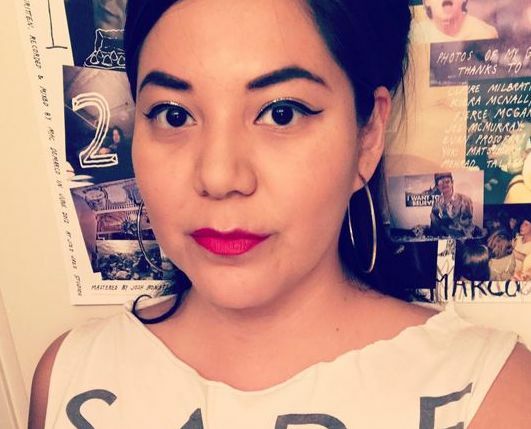 Amber McCrary is Diné zinester, feminist and writer. She was born in Tuba City, Arizona (Diné Bikeyah), and raised in the border town of Flagstaff, Arizona. In the small town of Flagstaff is where she discovered her love for punk rock and the Do It Yourself Culture.